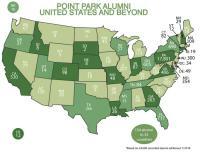 Alumni Relations Connect with Point Park and fellow alumni! Welcome to the Office of Alumni Relations at Point Park. We're here to provide alumni with a variety of ways to connect and reconnect to each other, to our current students, and to the University. From local and regional alumni events, to special benefits and services, the Alumni Relations office is your source for staying in touch with Point Park. Be sure to visit us often. We look forward to hearing from you! Check out - and RSVP for -the great events we have planned for alumni. We'll have more alumni events around the country coming soon! Details are on our Events page. To find out, check out our alumni map.